Former Massachusetts Gov. 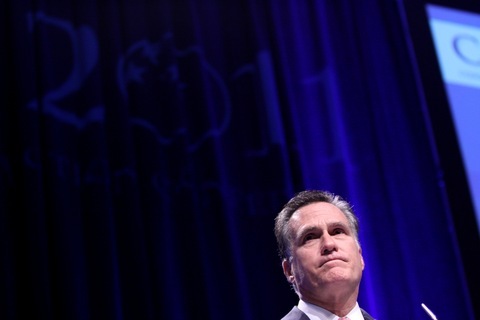 Mitt Romney is forming a presidential exploratory committee. Photo by Gage Skidmore via Flickr. The moment Mitt Romney officially tossed his hat into the 2012 presidential ring, the press coverage immediately turned to describe why the perceived front-runner is a flawed contender for his party’s nomination. “No conversation about the former Massachusetts governor begins with a listing of his strengths as a candidate. Instead, Romney is the rare national politician defined largely by his shortcomings,” write Jonathan Martin and Alex Burns of POLITICO. “The former governor would be well situated for the race under the normal order of things in the Republican Party, in which the establishment determines the front-runner early, and often turns to the person who is standing next in line from the previous race. The Boston Globe’s Matt Viser notes that Romney’s announcement comes at the five-year anniversary of the health care law he signed as governor, which was a model in some ways to President Obama’s national health care law. Eager to highlight Romney’s health care predicament with the Republican base, Democrats in key, early nominating states and in Massachusetts have planned celebrations and “thank you” events pegged to the law’s anniversary. The New Hampshire Democratic Party is holding such an event at 11:15 a.m. EDT in Concord, which promises to have a camera friendly, over-sized thank-you card, as well a birthday cake celebrating the fifth anniversary. House Republicans released the details of the six-month spending bill overnight Monday, putting meat on the bones of the framework agreed to last Friday. Because lawmakers weren’t able to beat a midnight deadline, the legislation will likely hit the floor Thursday in order to give members three calendar days before voting on the measure. “Never before has any Congress made dramatic cuts such as those that are in this final legislation. The near $40 billion reduction in non-defense spending is nearly five times larger than any other cut in history, and is the result of this new Republican majority’s commitment to bring about real change in the way Washington spends the people’s money,” House Appropriations Committee Chairman Hal Rogers, R-Ky., said in a statement. The savings come from across the federal government, including $5 billion from capping a fund awarding compensation to crime victims, $3.5 billion in unused funds from a health care program for children in low-income families, $600 million from community health centers, zeroing out funding for high-speed rail initiatives (plus rescinding $400 million already appropriated) and $80 million for the Corporation for Public Broadcasting, which supports NPR and PBS. Some $10 billion of the $38 billion in cuts came from reductions taken under the three previous temporary funding measures. By agreeing to the new round of cuts, the president and congressional Democrats were able to preserve — and in some cases enhance — financial support for some of their key initiatives. President Obama’s “Race to the Top” education program would receive $700 million in new funding; the “Head Start” early childhood learning program would get more than $7.5 billion; and the maximum Pell Grant award would remain at $5,550. The level and areas of cuts are sure to bother some Democrats, while more conservative Republicans have already expressed unhappiness that the agreement doesn’t go far enough to curb government spending. After weeks of negotiations and a near government shutdown, leaders on both sides must be hoping that they’ve come up with the right mix to get them the 218 votes they need to pass the bill in the House. White House Press Secretary Jay Carney spent a considerable amount of time during Monday’s press briefing making clear that President Obama wanted a clean debt limit increase bill with no spending cuts attached to it. It turns out that the president’s position is malleable. “White House officials have opened the door to a deal with Republicans that would allow the U.S. to increase its ability to borrow, potentially easing worries in financial markets that the country might default on its debt. “Softening the administration’s earlier insistence that Congress raise the so-called debt ceiling without conditions, officials now say they won’t rule out linking an increase of the borrowing cap with cuts aimed at reducing the deficit–even though they’d prefer to keep the issues separate.